Musicology Now: Quick Takes — Sonic Footprints of Doom in Darren Aronofsky’s Mother! Quick Takes — Sonic Footprints of Doom in Darren Aronofsky’s Mother! It’s been said that Darren Aronofsky’s style has the subtlety of a chainsaw, which is not entirely undeserved and can pose a big problem for an artist with a taste for “big themes”; but Aronofsky also possesses the technique of a virtuoso and a striking ability to conjure abstract, elusive, and esoteric concepts through innovative audiovisual means. You could say that Aronofsky’s audiovisual and narrative style channels the earnestness and brilliance of a Romantic artist/genius, amplified by the sensibility of the MTV generation and the tools of digital technology: the result can be embarrassingly pompous at times, but it never fails to hit the designated mark and then some. In his latest film Mother!, which addresses the plight of our exploited and abused planet, Aronofsky muses on the cyclical nature of history, the reckless, destructive, and violent nature of humanity, and the seemingly endless power of nature’s resurrection which has managed to sustain us so far. I couldn’t help but also read it as an allegory of a much more personal kind, an exploration of the dark rooms of the artistic soul; the exhilaration of creation and the terror of writer’s block; the conflict between the purity of inspiration and the corrosiveness of fame and need for recognition; and the ultimate selfishness of the creative drive which is willing to sacrifice everything that it can feed on, which – Aronofsky’s film suggests – applies both to the Almighty, embodied by the character played by Bardem, and to humans (who are “made in God’s image,” after all). My impression is that Aronofsky pursues both layers of meaning, following the dream logic of a nightmare. Shortly before the film’s general cinema release it was revealed that Aronofsky, in consultation with his new collaborator, composer Jóhann Jóhannsson, decided to eliminate the already-written score in favour of an elaborate sound design. Aronofsky stated that he didn’t want to give the audience “any relief by allowing them to lean back on something that easily gives you emotion.” Echoing the sentiment of many other directors who avoid the use of non-diegetic scores, Aronofsky’s comment goes to the heart of the central aesthetic question facing directors and film music composers today: should music fulfil its traditional roles by shadowing the characters, reacting to and illuminating the narrative, or could there be some other purpose to its presence in film? And, should music “tell the audience how to feel” or should its “hand-holding” function be eschewed for establishing a space for exploration, interrogation, and generally more active engagement of the audience? Hollywood’s answer to these questions is well known. Others who prefer more semiotically neutral film scores or no scores at all tend to look for alternatives in expressive sound designs which sometimes feature overtly musical qualities. Interestingly enough, Darren Aronofsky’s own hip hop editing style which he developed in his first two films, Pi and Requiem for a Dream, became one of the most recognizable tools of this new film sound vocabulary, epitomizing the digital-era style of sound and image musicalization which is imitated across audiovisual media. While Mother! does not exactly burst with the same ambition for audiovisual innovation, it does draw on the notion of sound design as an expressive device which can replace the functions of a traditional film score; it embraces the idea of musicality in its broadest sense while also taking advantage of the narrative and emotional ambiguities traditional scores tend to eliminate. The danger, of course, is that the lack of score can be experienced as a lack of emotional commitment and guidance from the film which denies the viewer an affective “reckoning” with it. I would argue, though, that this decision makes Aronfosky’s allegory more powerful, opening up a space for spontaneous and highly individual responses. Mother! is not a genre film but, as part of its strategy of undermining a single point of view position and interpretation, it pretends to be one for a good portion of its first half. Leaning on the archetypal “damsel in distress” scenario, it reinforces genre tropes by gravitating towards moments of surprise or anxiety-inducing ambiguity and by using sound effects in a manner typical of horror scores. 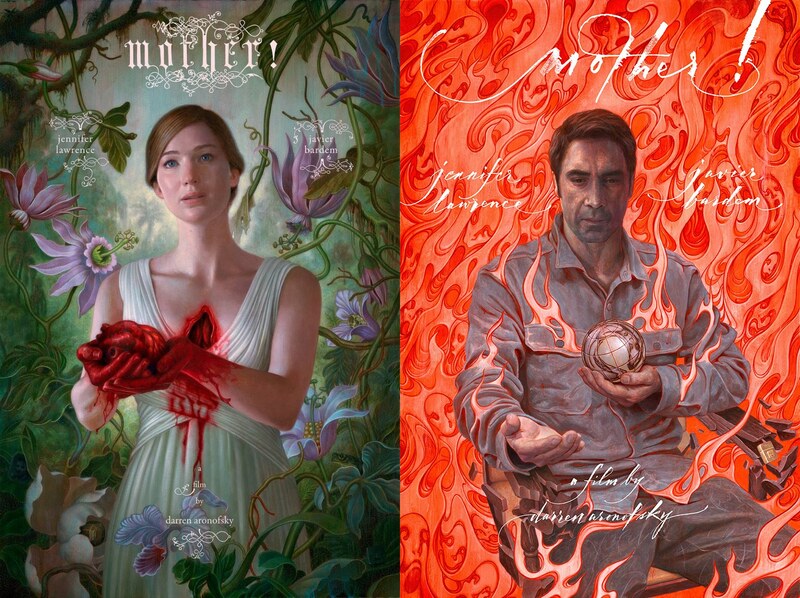 From the beginning the sound design encourages us to perceive the house in which Mother (Lawrence) and the Poet (Bardem) reside as a living, breathing organism which sighs, throbs, groans, and bleeds. Creaky sounds of doors and floorboards dominate the first half of the film and although mother is almost always barefoot, her footsteps nevertheless resonate through the house, alluding to its age and the mystical aspects of its nature. These sonic allusions gradually give way to increasingly visceral moments of discomfort. When uninvited guests start appearing at the house, their actions are sonically amplified with whooshes and echoes which affect Lawrence’s character, making her physically sick, as if she’s reacting to the guests’ “sonic footprints.” The repeated scenes in which Mother communicates with the house by placing her hands on the wall to feel its heartbeat are evocative of those key moments from Aronofsky’s earlier films – pill or drug taking, communing with the tree of life, etc. – which, treated as audiovisual samples, become symbolic of their core ideas. In this case, the image of a gradually shrinking and dying heart comments on the state of our planet, but the first time we see it, the sound in the scene is bent on creating a sense of suspenseful ambiguity, leaving the viewer guessing whether Lawrence’s character is mentally disturbed or if the house might embody some malevolent presence. It could be argued, though, that these sonic flirtations with horror conventions serve more as a comment on the nature of our relationship with Mother Earth than as an actual tool of suspense, because it is the later scenes in which the house is overrun by people that evoke the real terror of nightmares. Although the eye of the camera is generally focused on Lawrence’s beatific face, which is often framed as a Madonna from Renaissance paintings, the sound design reflects the chaos surrounding her, the shouts and mayhem caused by strangers filling the house to the brim. In the midst of all that, Mother’s repeated but ineffective requests to the guests to stop destroying her house and leave, and her helplessness in the face of humanity’s destructive nature, are more unsettling than any scenes of violence before or after. The God-like figure of Bardem’s character called “Him” in the credits and the Poet in the film is a Creator who preaches love and generosity but also abandons his abode from time to time and seems equally impotent when confronted with the human propensity for violence and destruction. He’s also vain and hungry for adoration, which seems to be the main reason his “projects” regularly end up burned to the ground. More disturbingly, he can create only by sacrificing those who love him. Aronofsky’s decision to have the male protagonist represent both God and the Artist is probably the most provocative and biting aspect of the film, which seems to carry both religious and autobiographical resonances. The audiovisual allusions to the divine aspect of Bardem’s character, however, are executed with the same playfulness Aronofsky displays when dealing with genre conventions. Apart from obvious biblical references in the narrative and some memorable low-angle shots, this character’s deific nature is also implied by sound, his voice reverberating unrealistically in several crucial moments. In one of those moments, when he comes to rescue Mother from a mob of uninvited guests, the unnatural volume and resonance of his voice is “explained” by his wearing of a gas-mask even though by that point in the film any expectations of the narrative being grounded in realism are long gone. The unlikely combination of an interest in esoteric topics and an intensely visceral type of filmmaking inspired some ground-breaking practices in the use of sound in Aronofsky’s early films. Mother! won’t be remembered for the same reason, but the passionate opposing reactions it has provoked with its allegorical narrative and storytelling style indicate that Aronofsky is not done with rearranging the landscape of contemporary American cinema. Danijela Kulezic-Wilson is Lecturer in Music at University College Cork. Her research interests include comparative arts, approaches to film that emphasize its inherent musical properties, the musicality of sound design and musical aspects of Beckett’s plays. She is the author of The Musicality of Narrative Film (Palgrave Macmillan, 2015) and co-editor (with Liz Greene) of The Palgrave Handbook of Sound Design and Music in Screen Media: Integrated Soundtracks (Palgrave Macmillan, 2016).